We are celebrating today on Monte Stella hill the Day of the Righteous of the Humanity. Milan confirms to be the moral capital of the cultural movement of the Gardens of the Righteous, which Gariwo has built in Italy and worldwide. In these days, hundreds of events were successfully held in Italy, Europe and the Mid-East: from Israel to Jordan, Poland, Britain, from Agrigento to Naples, Benevento, Rome, Brescia and Vercelli. This movement is led by the inspiring idea that every individual, in his own span of control, can always do something to stem hatred, anti-Semitism, racism, and can avert new cases of genocide, totalitarianism and mass atrocities against human beings. I would like to thank Milan’s Mayor Giuseppe Sala, City Councillor Pierfrancesco Maran, the President of the City Council Lamberto Bertolé, the Jewish community, the Armenian community and the Community of Sant’Egidio, who have believed in this great project. I would like to thank all the former Mayors of Milan, who joined us today to demonstrate their support to this Garden. We are in facts glad to have with us Piero Borghini, Gabriele Albertini, Letizia Moratti, Giuliano Pisapia. I would like to thank all the youths and their teachers, who are the backbone of this movement. I would like to thank those who, in this neighbourhood, have believed in the Garden of the Righteous and, in particular, Simone Zambelli, Enrico Fedreghini and Virginia Invernizzi. Eventually, the works for the re-design of the Garden have almost come to an end, and Milan will finally have one of its symbolic places for the education to responsibility, the respect of the other, the value of freedom and the construction of a shared world. I also would like to thank those who are no more with us, like my father Joseph Nissim, who gave an important support to the Garden and unfortunately will not be able to see it finished; and I would like to thank Ulianova Radice, Golden Ambrogino to her Memory, who put her heart and soul into the accomplishment of this project. I would then like to anticipate that a great movement for the defence of our planet in the face of climate change will start from here. Heeding the warning of our President Sergio Mattarella, we will in facts launch the theme of the Righteous for the environment. And we will do so precisely on Monte Stella hill, which the citizens would like to preserve as an oasis of green. Unless we face the environmental challenge, the humanity will have to face forced migrations and new cases of genocide. I would also notice a contradiction here. Whilst thousands of young people, dozens of city halls and towns are marking the Day of the Righteous, whilst the whole society is answering this call, for the first time in this Day’s history there has been no political signal from those on power. We have heard no declarations from the side of the Prime Minister, those in lead, the Minister of Culture – who I hoped would take part in this event. For three years we celebrated the Day of the Righteous in the Parliament, but this was not possible this time. I find the absence of institutional sensitivity about this recurrence very sad. About this Day, too, in facts, our country can decide whether to present itself with a generous soul and an openness to the Good and hospitality, or to choose the path of selfishness and nationalism, as it tragically happened in the Thirties about the Racial Laws. 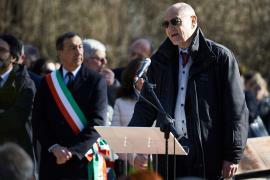 We are persuaded that the Italy of the Good and individual responsibility, which like Israel and Yad Vashem exports the idea of the Righteous, in the end will win, because this is our country’s best soul, which we have seen in the extraordinary demonstration of 2 March in Milan. Today we are in the face of a great challenge, which we have sought to highlight in this ceremony: defending the values of Europe, on which our fate depends. To the young people I say what Kennedy used to repeat. Don’t let’s only ask Europe to do something for us, but let’s see what each of us can do to strengthen and reinforce the European values. This is why today, with Simone Veil and Istvan Bibo, we remember the Righteous who have sacrificed their lives to create a peaceful, united, open Europe, without wall, dictatorships or forms of totalitarianism. And precisely because Europe represents the value of openness, democracy and dialogue, it must be a continent open to the demands of growth and liberation of Africa. This is why today we honour two great African Nobel laureates such as Wangari Maathai and Denis Mukwege. I would like to say something more about Istvan Bibo, as this figure has strongly marked my cultural growth. He was the first great intellectual of Eastern Europe to recognize the responsibilities for the Holocaust; and he was the last deputy to leave the Parliament of Budapest after the Soviet invasion; he was an intellectual who did not accept any compromise with Kadar. I take him as an example for the moral resistance to the new streams of populism that are growing in Poland and Hungary. But I would add something more. We cannot accept any compromise in Europe against the rise of the new streams of nationalism that can bring us back to the Thirties. From our Garden of Milan, from the stories we are remembering today, let’s launch a movement of moral resistance and hope.